Kissing Doves Magnetic salt and pepper shakers. Height 4". The deepest kind of Peace and Faith are represented by the Dove. 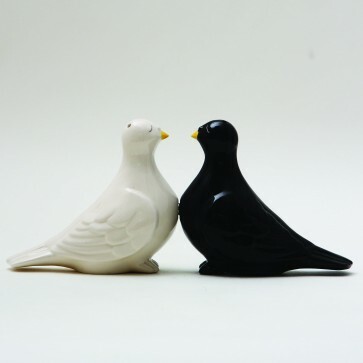 Bring peace to your home, and get the Kissing Doves 4" ceramic salt and pepper shakers. Features a magnetic insert to hold the two shakers together.